It’s a fact. Renovating your home is a major commitment that will disrupt your daily rhythm of life. Anyone who’s been involved in a remodeling process knows that the investment of time and resources can take on a life of its own. Design and build is an integrated process that gives you single source accountability. Hudson Valley Preservation creates a team that includes you every step of the way, while shouldering the responsibility for excellence, on-time delivery and yes- a fixed cost upfront. By bringing all the players under one roof, you have one firm (ours!) to deal with rather than assembling all the pieces yourself. We work with you from the beginning to end of the project to ensure you get exactly the home you want—one you are happy to walk into at the end of each day. Timing is everything. Embarking on a “simple” addition, and discovering unanticipated changes in the middle- is a scary possibility when a house gets opened up. Our discovery phase is dedicated to your peace of mind-we listen to your dreams, look closely at your existing buildings and property, identify practical solutions, and explore whether the project is in sync with your financial expectations. During this phase, which includes one to three sessions with us and takes about two weeks, we get to know each other to determine if we’re a good fit. No money changes hands until a design agreement is crafted to your satisfaction and signed by both parties. This agreement includes a broad scope of work and a target investment range. During the design phase we bring together your team-all the people necessary for your project. The design phase averages two to four sessions after which time; we present you with drawings, a timeline, final costs, and details on how the project will be completed and who your team is. Our unique 3D modeling software allows us to show you exactly what your design will look like-before a single nail is driven. After a thorough site assessment and input from you, we then generate your drawings. Changes can be implemented and discussed to your complete satisfaction before any work is started. This phase culminates in a signed construction agreement to get your project on the runway. At the beginning of this phase, we meet with you to set the ground rules for a construction process designed to disrupt your life as little as possible. We acquire permits, confirm the timeline, and discuss how we plan to implement the construction process. The length of the building phase varies by project; before it begins, you will have a clear idea of how long it will take. 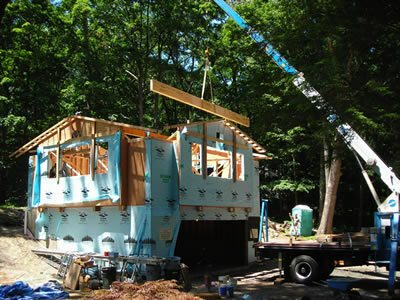 Hudson Valley Preservation uses a master carpenter system. An experienced lead carpenter is in charge of your project from start to finish and is on the job every day, making sure that your project is on track and moving forward. We keep the whole team on the same page via constant and immediate communication through phone, e-mail and digital cameras. When your project is complete, we don’t just vanish into the woodwork. We visit you 3-months later and again after 6-months to provide you with whatever support you need. We want to hear what you love as well as what might not be working so well. We come with our tools, ready to fix anything from a squeaky hinge, to paint you may have nicked when moving back into your new space. We visit again after one and two years to continue to give you the support you deserve.